Kids reading the book will appreciate that the author knows how to speak to more than just ice skating fans. Don’t get me wrong… for fans of ice skating this book is nothing short of a dream come true. If I don’t see a copy of this book in every single ice skater’s gym bag by the end of December I will eat my proverbial hat. But there’s a lot of rich writing at work here, above and beyond the obvious plot elements. It’s got a relatable heroine, three-dimensional villains, a rags to riches element, some convincingly exhausting sequences, and an ending that will probably catch a couple folks by surprise. You can read the full review here, but do note that the second-to-last paragraph contains just a bit of a spoiler, so you may want to skip that part if you’re the kind of reader who likes to discover all of a book’s secrets on your own. I’m looking forward to this Saturday’s Rochester Children’s Book Festival at Monroe Community College — one of my favorite events of the year! It’s a high-energy celebration with more than 40 children’s authors & illustrators. If you’re a Western NY person, I’d love it if you’d come by and say hello! I’ll be signing my regional historical novels as well as THE BRILLIANT FALL OF GIANNA Z. I’ll have SUGAR AND ICE bookplates to sign, too, and Lift Bridge Books will be taking pre-orders for the hardcover, which comes out December 7th. I’m also excited about NCTE in a couple weeks. 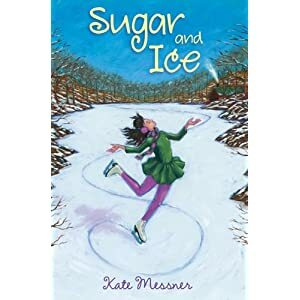 I’m participating in a panel presentation on Skype author visits, speaking at the Middle Level Mosaic, and signing THE BRILLIANT FALL OF GIANNA Z. and ARCs of SUGAR AND ICE at the Walker/Bloomsbury booth on Saturday, November 20th. I’ll post my full schedule with times, etc. when I have it. I also got an unexpected email from my Scholastic editor this week, letting me know that ARCs of MARTY MCGUIRE, the first title in my new chapter book series illustrated by Brian Floca, will be ready in time for NCTE as well! If all goes as planned, I’m scheduled to sign MARTY at the Scholastic booth from 10:30-11:30 on Saturday, right after my Walker/Bloomsbury signing. SUGAR CHANGED THE WORLD by Marc Aronson and Marina Budhos is a fascinating and compelling work of narrative nonfiction that looks at the history of sugar, or rather, the history of the world as it was shaped by sugar. Amazing book – and I’ll have more to say about it later on.